We were delayed briefly by a gale offshore. Even inland, on the Intercoastal Waterway, winds were a sustained 20k with gusts to 35k, from the northeast and east. In southern Georgia, the Waterway crosses sounds and rivers that take us into the ocean and/or are very open to the ocean and to the strong east winds we were getting. There were surf warnings and small craft advisories. First it was just a lot of wind and we were staying ahead of the thunderstorms and rain as we traveled northward. We could track the storms on radar and see them behind us. We’ve had a lot of wind most of the trip north, but the strong northeasterlies started in Georgia. Just past the FL/GA border is St. Andrew Sound, which requires about a 8 mile run directly NE out into the ocean and then back to the NW and behind Jekyll Island. We were slogging up the Cumberland River towards the Sound, making 3.4 mph instead of our usual 6. Motoring directly into the wind. No huge waves because we were still in the river, but lots of wind, whitecaps and spray. Motu Iti’s bow would rise up on a wave and then crash down into the trough. The spray was like someone standing in front of you and throwing buckets of salt water at you. We have a canvas dodger, which gives some protection, but not enough. Every minute I was wiping my face and glasses – I had towel in the cockpit for that sole purpose. We had on our foul weather gear and the charts were in plastic sleeves. Up, crash, bloosh; up, crash, bloosh. It’s a great boat and doesn’t pound, but that kind of motion can wear you out. And we weren’t even in the Sound yet. According to the chart, there is an alternate route around St. Andrew Sound for shallow draft boats. Our information was that it would carry 2.5’ at MLW (mean low water). It’s recommended for 5’ draft boats (like Motu Iti) only on half tide or more. We passed Floyd Creek, the entrance, and debated – up, crash, bloosh; up, crash, bloosh. We decided to try it. We figured that it was just past high tide. Meaning we would have water over MLW, but that if we did run aground, we’d be stuck through a falling tide and until the water came up again – at least 6 hours. Up Floyd Creek, across the Satilla River and then onto Dover Creek and across Jekyll Sound to Jekyll Island. About 12 miles. All winding and fairly narrow. I used the handheld GPS to help Goldwin steer the boat. It was nerve-wracking. Sometimes we were within a boat length of grass growing up out of the water. Always expecting to run aground. Not a good place to be on a falling tide. We kept going. Once, right by a green mark, our depth sounder read 5.2 feet – Motu Iti needs 5 feet of water to float. But we never touched bottom. 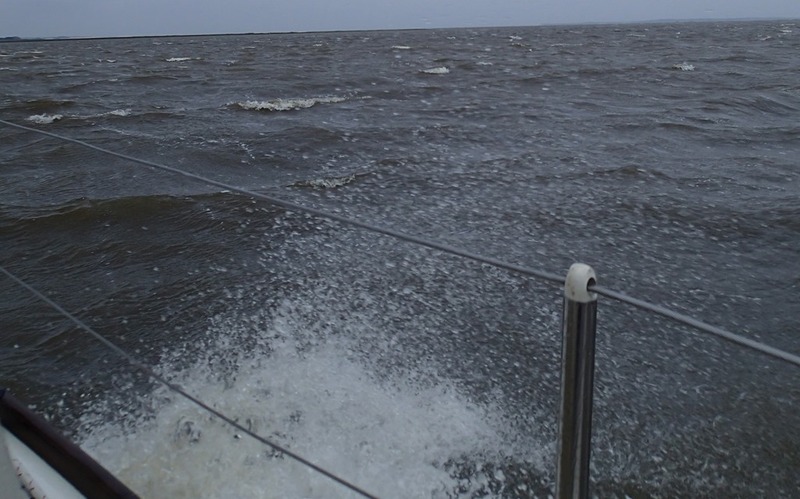 We continued to Jekyll Island and anchored just south of the marina in about 15 feet. It really blew that night. Made it hard to sleep. Now NOAA was giving gale warnings offshore and small craft advisories for the waterways. We considered whether to leave in the morning. We could go about 45 miles that day with only one sound, St. Simons, and it was small and offered some protection from the NE. So we left. We stayed north of the rain except for some light stuff in the morning. 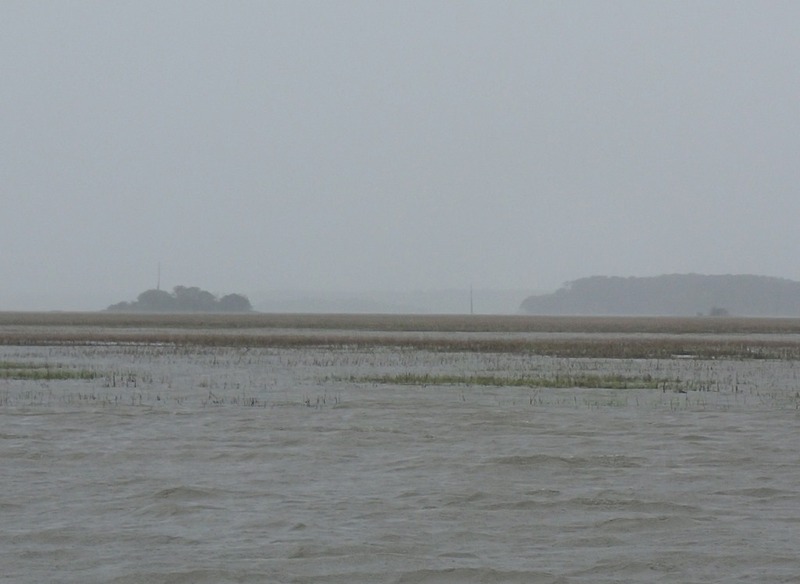 The channel at Jekyll Island is not my favorite – it’s where we ran aground on the trip down. Again, we saw 5.4 feet near a green mark, but we didn’t hit bottom. 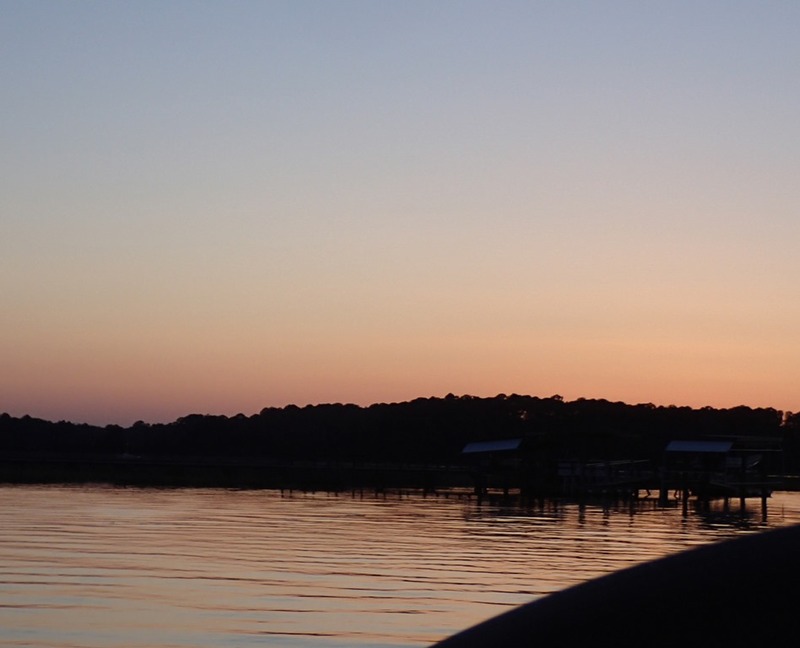 We anchored that night just south of Sapelo Sound. We chose New Teakettle Creek mostly for lack of suitable alternatives. It’s a narrow winding bit of water in the middle of a huge grassy marsh. Nothing for miles. Not even cellphone service. No more radar (from my IPhone). The wind was howling when we anchored, but we felt we had a good set. There were other boats anchored along the creek as well. We couldn’t sleep. There were too many sounds I wasn’t used to and I found them very alarming. Were we dragging? How hard would it blow? Would we be okay? All night long the wind whistled and howled, the boat sailed around on the anchor, wavelets slapped into the hull, halyards banged, the rig shook, the boat heeled over, and it rained. The next morning NOAA weather reported that an offshore gale would continue through Saturday night. Sustained winds of 20-25k with gusts to 40. We made a decision to stay at anchor. Other boats left. But the route through the next sound – Sapelo Sound – would require us to travel about 9 miles to ENE and is wide and open to the ocean from that direction. At 3 mph, that would take us almost 3 hours – a long punishing ride. It rained all day long. The wind was lighter in the morning, but gained strength throughout the day. Constant and steady howling, rocking, shaking. And it was cold. We tried to take advantage of our delay: Goldwin read books and I read, knitted and made bread. There was an underlying strain – a steady stress of not knowing if we would stay safe. And it was just so desolate. Lots of nothing for miles. Unnerving. Another night of howling wind, rain, rocking, and worry. Our anchor held. The next morning, we debated whether to leave and, again, decided to stay put. Same weather from NOAA – an offshore gale with sustained winds of 20-25k and gusts to 40+. We contemplated why exactly we needed to move the boat anyway. And why we were even on a boat in the first place. More books. I made pizza dough. We were on canned food only by this point, but I had a lot of cheese (from CA). Our pizza toppings were canned chicken, artichokes, and pineapple. We thought it was amazing. It was clearly the highpoint of the day. By now, although we had been at this anchorage for only two nights, we had not been off the boat since we left Vero Beach 8 days before. What a difference a day makes. That evening, to our northeast, we could see the enormous anvil thunderheads of the huge storm; and occasional lightning bolts. The next day we were in Beaufort, at our friends’ dock. Whew! Long, hot showers, a wonderful meal and great company. Many thanks. What you are doing now is work, for your brain and the boat. Sounds like you are on Dinosaur power more than wind. I like that you don’t have the killer, get homeitis and you are making careful well thought out decisions. I love following your course but even more for me is having a chance to hear how you and Goldwin make your decisions and how very talented you are as sailers. I could say be safe but continue to be wise and you will be safe. When we did the loop, we were advised that people either pick their weather windows or take up golf. We tried to stick to that, but sometimes the forecasts didn’t pan out. Better than pushing it constantly, tho.